Come and enjoy the unlimited opportunities of winter fun! These are the best ski resorts in the US: Lake Tahoe, California; Big Sky, Montana; Sun Valley, Idaho; Park City, Deer Valley, Utah; Jackson Hole, Wyoming; Arapahoe Basin, Aspen, Beaver Creek, Breckenridge, Copper Mountain, Crested Butte, Keystone, Silverton, Steamboat Springs, Telluride, Vail, Winter Park, Colorado. 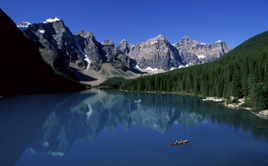 In western Canada the best, largest resorts are: Whistler, British Columbia and Lake Louise, Alberta. Most of the Colorado resorts are very close to each other and they are famous for their champagne powder snow. There are slopes for every level skiers, with tree skiing, bumps, steeps, moguls, open meadows. Some resorts offer tubing, cat skiing and even heli-skiing. Season starts between the end of October to December and ends from mid April to June.